Aspire-Ho by Bathams Racing riders Peter Hickman and Michael Rutter secured a one-two at the 52nd Macau Motorcycle Grand Prix. Pole man Peter Hickman claimed his third Macau Grand Prix victory in Saturday’s red-flagged race in southern China. Hickman tailed early leader Michael Rutter before making his move to take the lead from his Aspire-Ho by Bathams Racing team-mate on lap four. Race winner Peter Hickman leads his Aspire-Ho by Bathams Racing team-mate Michael Rutter in the 52nd Macau Motorcycle Grand Prix. The Senior TT winner was beginning to open a gap at the front when the race was stopped with three laps of the 12-lap distance to go following a crash involving two riders at Fisherman’s Bend. Ben Wylie crashed out on his Bimota and fellow English rider Phil Crowe was caught up in the incident after colliding with Wylie's machine. Crowe escaped unscathed, although Wylie was taken to hospital. His condition is not understood to be serious. 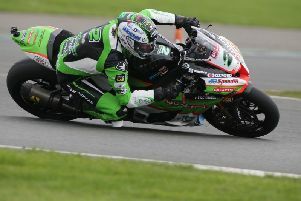 Hickman was declared the winner on his Smiths BMW from eight-time winner Rutter by 0.795s, who sealed a fine runner-up spot in his maiden race on the Honda RC213V-S.
Martin Jessopp came through to pick off Danny Webb (Penz BMW) to take third on the PBM Ducati – 7.4s back on the leaders – with Gary Johnson (Briggs Kawasaki) and Horst Saiger (Yamaha R1) completing the first six. Australian David Johnson brought the PR Racing BMW home in seventh place, over 22 seconds down on Hickman, while Dublin rider Derek Sheils put in a solid performance to secure eighth place on the Penz BMW. Sheils edged past impressive newcomer and Penz team-mate Davey Todd in the closing stages, while Morecambe’s John McGuinness – making his Macau return after missing the event last year through injury – rounded out the top 10 on the PBM Ducati. Skerries man Michael Sweeney was 13th on the MJR BMW ahead of newcomer Paul Jordan (Dafabet Devitt Kawasaki).